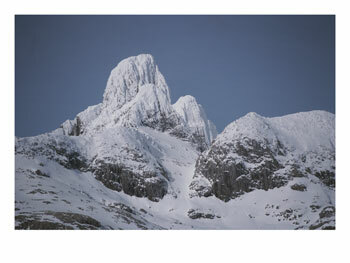 Art historian Clive Bell famously described the contrast between virtuosic and communal art production as "cold peaks" versus "snug foothills of warm humanity." High culture's anxiety about distributed culture has reached new levels thanks to the explosion of participatory media online. Drawing on themes from At the Edge of Art, a book he co-authored with Joline Blais, Jon Ippolito asks what's lurking in those snug foothills that gets academics all hot and bothered. 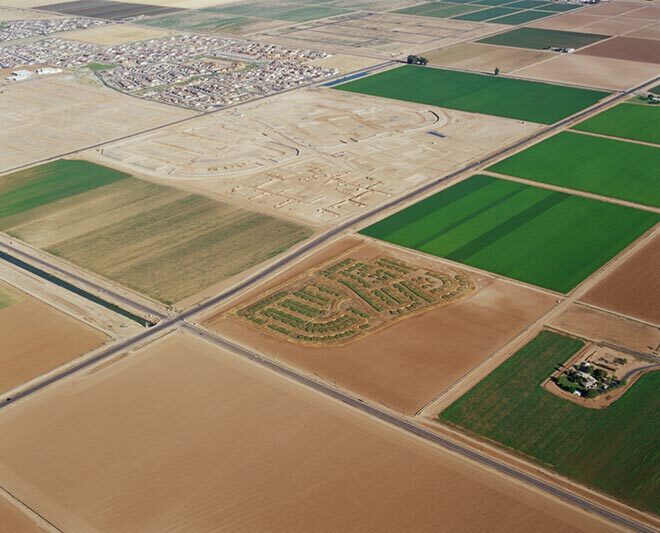 This talk was first given at Herberger College for the Arts, Arizona State University, Tempe, on March 6, 2007. 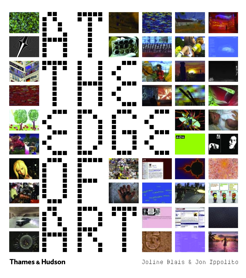 The ideas in this essay are derived from concepts introduced in the book At the Edge of Art by Joline Blais and Jon Ippolito. "I have tumbled from the superb peaks of aesthetic exaltation to the snug foot-hills of warm humanity...."
"I have tumbled from the superb peaks of aesthetic exaltation to the snug foot-hills of warm humanity....And let no one imagine, because he has made merry in the warm tilth and quaint nooks of romance, that he can even guess at the austere and thrilling raptures of those who have climbed the cold white peaks of art." In a presentation at the 2006 College Art Association conference, artist Tim Jackson cited this 1914 quote by art historian Clive Bell to describe the anxiety felt by art professionals in an audiovisual landscape increasingly dominated by participatory media like Flickr, YouTube, and MySpace. Were he alive today, Bell would probably not have viewed these 21st-century foothills, overflowing with kitten photos and amateur music videos, as wellsprings of authentic art. That's why we have a canon, after all--that archipelago of aesthetic peaks that Bell celebrated in his topological metaphor. No pack of acne'd amateurs armed with Photoshop and Final Cut could possibly pose a serious threat to the canon. But if that's true, why did my mention of distributed creativity at another panel that day trigger a defensive reaction among CAA panelists, who launched into a diatribe about the perils of a democratic approach to art? One prominent scholar went so far as to chide me by saying, "Now, Jon, I'm sure you don't intend to put professional art historians out of work." What's lurking in those snug foothills that gets academics all hot and bothered? Before we descend into the foothills of distributed culture, let's remind ourselves what those cold, white peaks of art look like. Here's a place I worked for 15 years--a cold white monument of Modernist architecture described by the curator who commissioned it as a "temple to the spirit." Undeniably an extraordinary building, the Guggenheim houses some of the pinnacles of 20th-century Euro-American art history, works like Carafe, Jug, and Fruit Bowl by Pablo Picasso, inventor of Cubism. 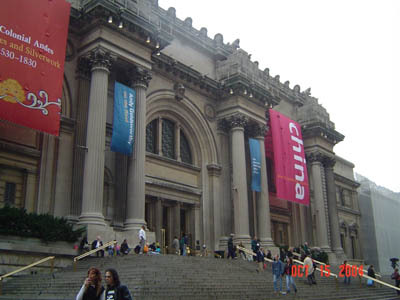 Of course, New York City is host to other museums that occupy the same aesthetic stratosphere as the Guggenheim. 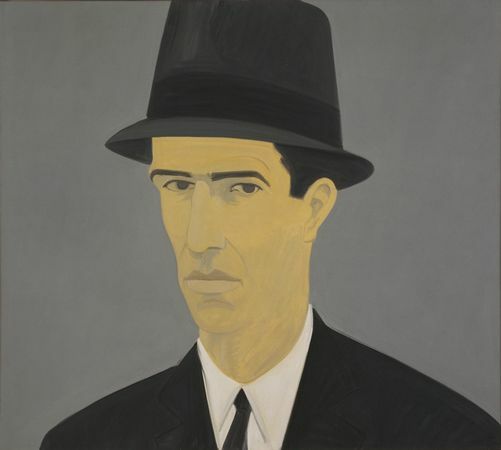 Enshrined at the Museum of Modern Art you'll find this painting by Pop Art pioneer Alex Katz, a more recent addition to art's pantheon. New York is also home to an elite class of private collectors like the Kramarsky family, owners of such masterworks as Vincent van Gogh's Portrait of Dr. Gachet. Personally, I love to visit such rarae aves at the Guggenheim, MoMA, and other lofty aviaries of art. And it's a lucky few who glimpse the masterworks cloistered away in the homes of elite collectors. But don't mistake the hutch for the habitat: these remarkable specimens were neither hatched nor discovered on these rarefied crests of culture. They began life in the dense landscape below, nourished by small creative communities based on shared contact and passion. 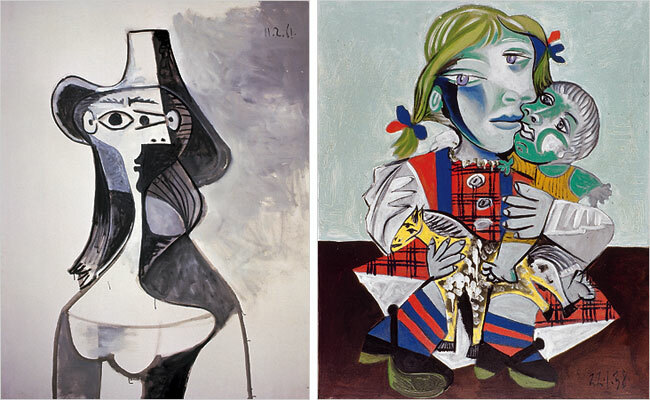 Picasso didn't invent Cubism; Cubism was a collaborative enterprise. Picasso and Braque eked it out together in a squalid tenement in Bateau-Lavoir and a tiny town in the Pyrenees, after Matisse had introduced Picasso to Congolese sculpture and Cezanne had sketched the way forward. 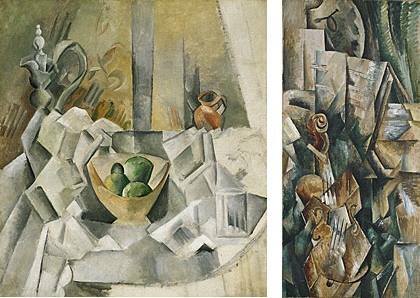 Picasso and Braque didn't even sign many works of the Analytic period, perhaps in homage of their collective enterprise. 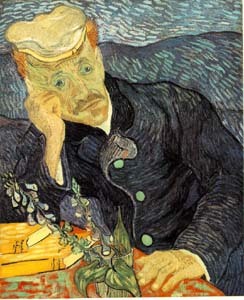 Even Van Gogh, the paragon of artist as rugged individualist--at least when played by Kirk Douglas--demonstrated in his portraits a bitter loneliness and a profound debt to the people who tried to befriend or help him, like Dr. Gachet. 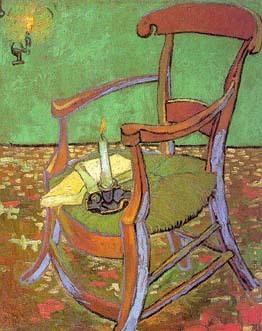 Sometimes the very furniture he painted could serve as a marker of a fellow artist, such as his friend and departed roommate Paul Gauguin. Post-Impressionism and Cubism came from the foothills. 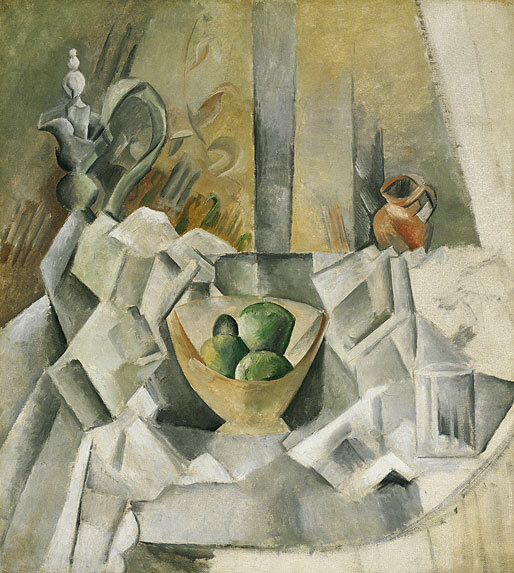 ABOVE: Pablo Picasso, Carafe, Jug, and Fruit Bowl, summer 1909; Georges Braque, Violin and Palette, autumn 1909; Vincent van Gogh, Gauguin's Chair. Perhaps the most heroicized period in art history, the New York School of the 1940s and 1950s, was a profoundly local phenomenon--a time when New York had 100 artists instead of 10,000 and 20 galleries instead of 400. Only artists went to openings. Although the public audience for these creators was practically nonexistent, their private audience--the one that really sustains them--was indispensable. Here's Alex Katz again, not on the wall at MoMA but back in his native habitat: the Tanager Gallery, one of the first artist-run alternative spaces, and a harbinger of the SoHo art scene. The guy at far right is my father, Angelo, who co-founded the Tanager. He unwittingly gave Jasper Johns his first gallery show when a wall piece submitted by then-unknown Robert Rauschenberg turned out to have a Johns piece hidden inside it. Even after they began to show in uptown galleries, art stars like Franz Kline and Willem de Kooning frequented the Tanager because they knew that an artist has two audiences. One is the public world of wealthy collectors, museum curators, magazine critics, and other middlemen. The other is the private world of peers who drop by your studio or hang out at the Artist's Club or Cedar Tavern, debating art in words and paint--thus providing the local matrix that really sustains you and your work. Do artists only need each other? Well, it's not exactly accurate to say these movements emerged and prospered without critics or historians; it's just that those folks didn't always know they were going to be critics or historians at the time. Take Irving Sandler, now recognized as one of the foremost authorities on Abstract Expressionism. His first job in the art world was to man the desk at the Tanager, and he learned more from that tour of duty than any PhD program could teach. Sandler was no jet-setting Documenta curator taking a break from the peaks to slum in the foothills. He once recounted how he'd met my father at Ciro and Sals restaurant in Provincetown, where my father had been a waiter. "Were you a patron?" I asked. "I was the dishwasher," was his reply. 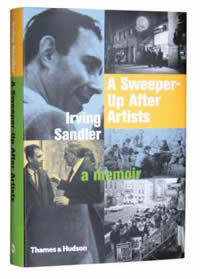 The title of Sandler's memoirs of the period, "A Sweeper-up after Artists," was an affectionate epithet given him by poet Frank O'Hara, and an acknowledgment of his role in the trenches of cultural production. So no, I don't think distributed culture will put art historians out of business. But I don't hold that remark against the scholar at CAA who told it to me; after all, we go back a ways. He used to hang out in the studios of my friends in art school--before he became interested in art history. So the "high points" of 20th-century art production actually took place in the valleys. But doesn't someone still need to do the job of trekking through the ravines of popular culture, uncovering marvels and lugging them back to the white cubes of Chelsea for us all to appreciate? Isn't that what ultimately distinguishes the clutter on YouTube from the curated film program in MoMA's theater, that an expert has bothered to separate the wheat from the chaff? Well, this is a rationale that keeps plenty of experts employed, but it makes life an uphill climb for artists, historians, and institutions that aren't in the center. For many in the art world's upper echelons, art outside of New York is a contradiction in terms. 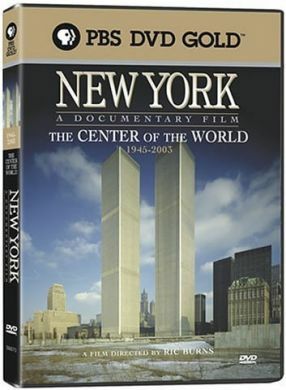 As the title of Ric Burns' documentary suggests, New York is the "center of the world"--at least to New Yorkers. 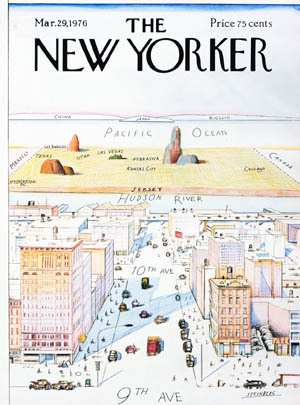 Saul Steinberg lampooned this attitude in his famous myopic New Yorker cover, "The View from Ninth Avenue"; ironically but appropriately, the neighborhood depicted in this 1976 cartoon is Chelsea, the current epicenter of the world's art galleries. But you're no slouch; not to be put off by distance, you make the trek to the Big Apple and plunk down a pretty penny for a studio in Williamsburg. Let's look at the costs of making ten paintings to show visitors to your studio, and compare it to the cost of making ten works of Internet art to host on the Web. Total annual expenses for starving painter (10 paintings): $10,000. Now let's say you're a net artist. You don't actually need your own computer to make a Web site, as long as you're near a library with computer access. But say you're out in the Arizona desert in a farmhouse with nothing but electricity and a phone jack. 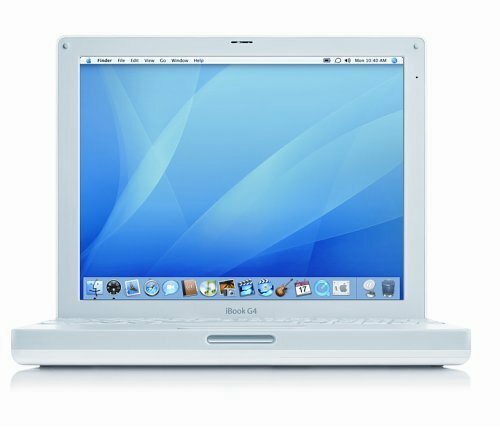 Spring $800 for an iBook and $200 for annual Internet access. You can now get free email (hotmail), and free Web hosting (geocities), and loads of free software (Firefox, GNU/Linux, Jedit, Open Office, GIMP, Inkscape). The cost of typing background-color = "skyblue" into an HTML document? Zero. Total annual expenses for starving net artist (10 Web projects): $1,000. Like that studio in Williamsburg, paint is a scarce commodity. Pixels aren't. To make art in a distributed fashion is to sidestep the art world's centralized "all or nothing" economy, joining networked ecologies that may confer prestige or feedback rather than cash. "Yes, but it's hard to sell a Web site, while selling paintings gives me a shot at fame and fortune." Sure, and while you're at it, why not buy some lottery tickets? Centralized culture cannot afford more than a handful of art stars; as art historian Eddie Shanken put it, "A canon can only be so large; for every work added, one must be removed." And the statistics aren't good for those on the art world's "long tail": a recent study found 82% of visual artists gross under $5,000 annually. If you're lucky, that will fund your Williamsburg studio for a few months. How about those government subsidies European artists get? Grants are a terrific boon to artists, especially those on the cutting edge of research. But they are also extremely inefficient; a recent study found 90% of the arts budget going to administration, leaving 10% rest for the artists to buy paint. 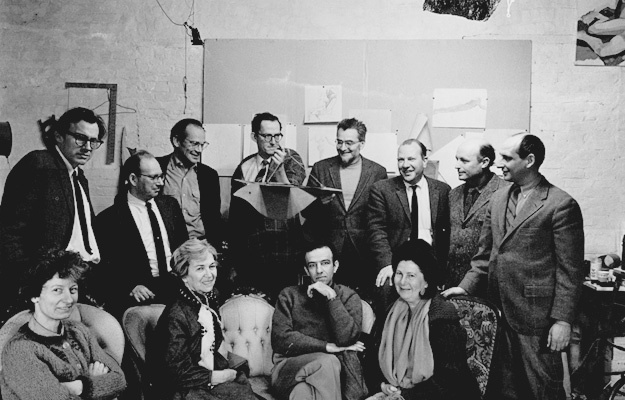 Nor are institutions immune from pressure to join the art world's pyramid scheme. Museums are staging blockbusters instead of focused exhibitions and christening new wings to encourage corporate sponsorship rather than to exhibit their collection. Universities are feeling the effects of measuring their "product" according to a market economy, from researchers whose innovations are owned by the lab lawyers to scholars who can't assign their own articles as homework because their library can't afford the journals they're published in. The lust to commodify education has gotten so bad that the University of Texas recommended teachers make students sign a "classroom license" forbidding them to re-use their teachings outside of class. "What happens in class stays in class"--what is this, the Las Vegas teaching method? Let's not even start on the environmental costs of centralized culture--except to say that the Metropolitan Museum takes up two million square feet of green space, and Paul Gauguin contributed a lot fewer greenhouse gasses when his creative community shifted from Paris to Tahiti. SOURCES: 1. "A Socio-Economic Study of Artists in Scotland," 1996, cited at http://www.international-ivas.org.uk/objectives.html, accessed March 3, 2007. 2. The Scottish Artists Union, www.sau.org.uk, accessed March 3, 2007. Even if you can afford to move to New York and make ten paintings, that's no guarantee you will make it past the gatekeepers of centralized culture. Whether you come from Slovenia or Saint Paul, the last mile from your studio in Williamsburg to that gallery show in Chelsea will be the hardest. Go ahead, drop off your slides with the underpaid receptionist behind the gallery desk; you'll find them back in your mailbox so fast you'd swear they were sent by bike messenger. Ask any artist how they broke into a gallery, and chances are it will be a recommendation from someone already inside the system. Exclusive cocktail parties and private openings are where art world careers are made. The centralization of culture sometimes helps urban art historians. Historians in London must feel delighted to have the Elgin marbles in their backyard--that is, when they're not feeling guilty for robbing them from the backyard of historians in Athens. But canonizing an artwork can also reduce every historian's access to it. Van Gogh's Dr. Gachet, for example, has been in and out of the public view since van Gogh's sister-in-law first let it go for 300 francs in 1897. Having narrowly escaping destruction by Hermann Göring, who confiscated this example of "degenerate art" from a Frankfurt museum, the good doctor was finally sold in 1990 by the Kramarskys to Japanese businessman Ryoei Saito for $82 million, who pledged to take it to his grave--quite literally, by cremating it. No one knows where the painting is today, but we do know that its canonization has led to its disappearance. 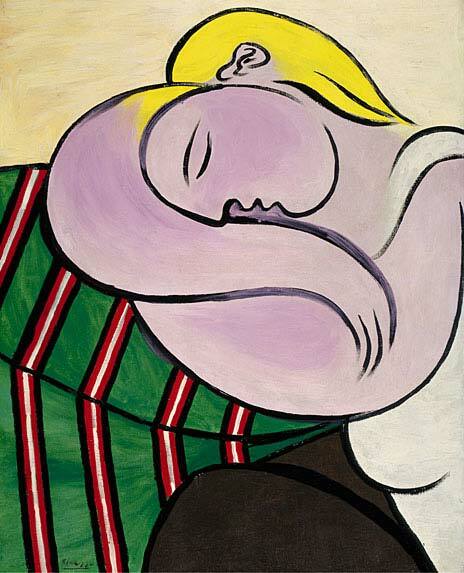 Nor is this painting the only victim of its own success, as the March 2007 theft of two Picassos in Paris reminds us. Want a big audience for your creative output? Even if you land a gallery show in Chelsea, the numbers are against you. By 2006 the photo-sharing site Flickr had 250,000 users and 4 million photos. Flickr also has discovery tools, including folksonomy tags, algorithms to find what's interesting, and search engines like Retrievr that let you sketch the photograph you're looking for. The audience numbers are skewed for art historians as well. Publish in an academic journal and a handful of people familiar with your subdiscipline might read it. In a new media context, by contrast, influence is counted in four to seven digits rather than two to three. 50 million Americans visited blogs during the first quarter of 2005. This is something the hard scientists figured out a while ago. Grigory Perelman, the scholar who recently proved the Poincare Conjecture--known as the "Holy Grail of mathematics"--didn't even bother to publish his proof in a peer-reviewed journal. He just uploaded it to a Web site. How can arts makers, scholars, and institutions take advantage of distributed culture? A good start is to acknowledge that words like "canon" and "professional" are euphemisms for exclusion. But we can do more. Some critics argue that the current canon is biased and needs an injection of female/ethnic/non-Western/digital artists. I sympathize with this argument--it is frustrating, for example, that art history surveys like Jansen's History of Art or Krauss et al's Art After 1900 make no mention of important figures like Billy Kluver or Cai Guo Xiang. But no pantheon with a limited number of alcoves reserved for Great Art is going to remain inclusive or relevant, no matter who is the gatekeeper. What art needs to thrive is not a zero-sum game, but supple and diverse subcultures of interest--subcultures that can stretch, fork, and overlap as necessary. The books in a library do a fair job of serving subcultures of interest, but they are limited by the number of shelves and trees available to pulp. Digital culture offers a much more expandable model, because we can add as many bits as we want to the Internet without filling up the last shelf. We see an explosion of such overlapping subcultures online, in the user recommendations of Last.fm, in tag-based article finders like Connotea, and in peer-filtered references like Wikipedia. When users refine these systems by adding a new audio track, tag, or article, it doesn't detract from the existing ones--it adds to them. While they encourage diverse communities of appreciation, these social networks don't encourage the blinkered specialization we often find in print-bound academia, with each monk toiling away in a separate nook of the scriptorium. These canon-killing interfaces are designed to highlight serendipitous overlaps. You may not think you like Country music, but if you like Bob Dylan and Bruce Springsteen, Last.fm will tell you to listen to Steve Earle. In the age of broadcast media, the only way for someone from a foothill to speak to other foothills was by climbing a peak. In the age of the Internet, the foothills don't need the peaks--they can talk to each other. 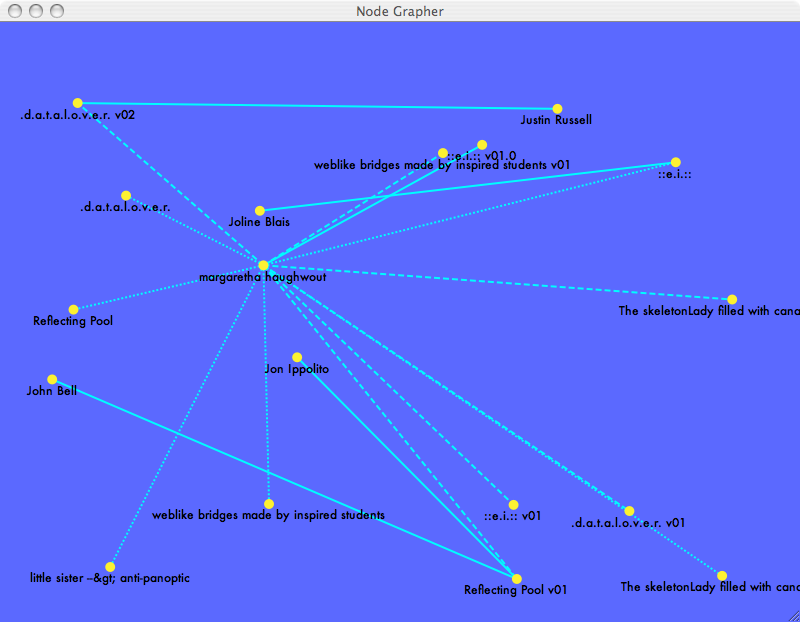 ABOVE: Jerome Knope's Social Network Grapher for The Pool. When I worked at the Guggenheim, many of our projects were designed to exploit economies of scale. 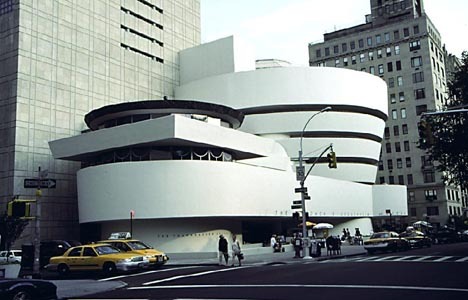 The projects at the biggest scale were the Guggenheim's satellite museums, of which the best known is the Guggenheim Bilbao but which also include buildings in Venice, Berlin, and Las Vegas. Each of these venues was relatively autonomous, operating on its own budget and making most of its own exhibition and collection decisions. And some amazing architecture resulted from the program, as anyone who's seen Frank Gehry's glittering curves rising out of the Basque hills can attest. Nevertheless, the urge to expand got the better of us, and as more and more ambitious architectural proposals for new cities piled on, eventually the "Guggenheim Galaxy" crumbled under its own weight. How could the Guggenheim's plan have succeeded? By spawning instead of scaling--concentrating on creating the conditions for independent, viral propagation instead of ever bigger and shinier buildings. 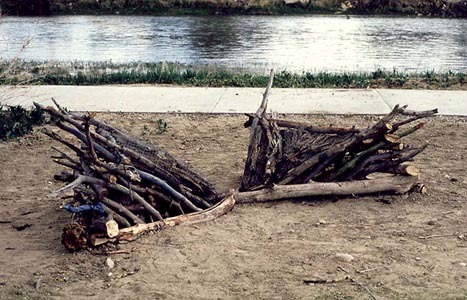 Spawning is how open source software, grass-roots politics, and nature succeed. Much of the deleterious impact from our footprint on this planet is due to its scale. Maybe we should be lighter on our feet, making smaller footprints that don't last as long. The Guggenheim came closer to a distributed approach in a relatively unknown program of lending work from its collection to smaller museums in the United States. The Guggenheim has over a dozen Picassos but only displays a few at a time; New Yorkers didn't miss the one or two lent out to small-town museums, and residents of those towns flocked to see those paintings on their walls. Unfortunately, the Guggenheim's administrators chose to evaluate this program according to the criteria of a centralized rather than distributed success; it was cancelled because--surprise!--there was no money in it. From the perspective of a cold peak, the cancellation makes perfect sense. From the perspective of the snug foothills, it was a tragedy. The lesson here is to resist the knee-jerk impulse to evaluate distributed projects according to the criteria of centralization. Base your evaluation on the effect on all the stakeholders impacted by your decisions, not just the column totals in your annual report. Even better would be to level the playing field between central and peripheral museums--for example, by requiring a painting gifted to one museum to be loaned to other museums periodically. It's not that we need more siphoning of art from the periphery to the center and back again. We need not centripetal or centrifugal motion, but convection--the circulation of creative work among overlapping and permeable communities of creators and beholders, whether they are united by geographic or online connections. ABOVE: Woman with Yellow Hair (Femme aux cheveux jaunes), December 1931. Oil on canvas, 39 3/8 x 31 7/8 inches. Solomon R. Guggenheim Museum, Thannhauser Collection, Gift, Justin K. Thannhauser. 78.2514.59. © 2005 Estate of Pablo Picasso/Artists Rights Society (ARS), New York. Galleries and museums don't know how to sell artworks that are dispersed, collaborative, or ongoing. Once museums got hold of him, Nam June Paik turned from avant-garde musician to video-installation artist, while Josef Beuys turned from performance artist to creator of scribbled blackboards and corners of fat in vitrines. The unfortunate consequence of this insistence on framing is ultimately a misrepresentation of twentieth-century art history--a denial of the fluid and collaborative cultural matrix that gave rise to these artifacts. To recognize art that is pure research, on the other hand, is to admit the possibility of a practice that is continuously gradated, where it is impossible or misleading to draw a line to separate one artwork from another. Respecting its lack of frame is important not just for the recognition of research but also for its perseverance. Unfortunately, a common strategy for preserving performances, Web sites, and other works in ephemeral media is to archive documentary photographs, audio, video, or props. But in the translation to framed documentation, artistic research can quite literally lose its place. Lynne Hull creates site-specific outdoor sanctuaries for birds whose migration patterns have been upset by deforestation and climatic change. To cut her work out of its original context and plunk it in a gallery would be to lose more than its context--it would be quite literally to sacrifice its primary audience, which is not even human. 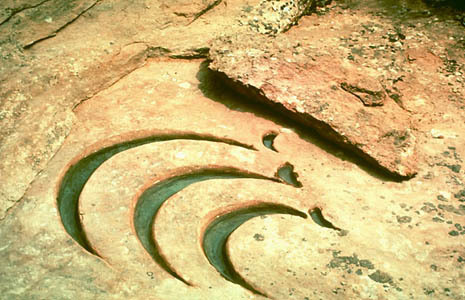 Birds feed from or take temporary residence in Hull's earthworks and sculptures. While an ornithologist could mine data on avian behavior from this work, it is ultimately the irreproducible results that make it interesting as site-specific art. Hull's photographs and maps should by no means be confused with her research. The "estates" of Matthew Moore are also grounded in a specific place. 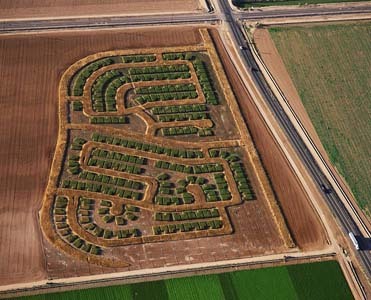 This third-generation farmer renders scale models in sorghum and black-bearded wheat of tract housing rampantly encroaching on his land in the Southwest. What a shame it would be for his photographs to be whisked off to a collector's wall in New York, leaving no trace behind. For while this framed relic might provoke a few sympathetic nods among environmentally conscious New Yorkers, Moore's intervention is needed on his own ground, in his place--and it is needed urgently. Ours is a warming world in more ways than one, and those who cling to the cold, white peaks of art may find their premises melting away under their feet. I know plenty of curators and scholars who are now gingerly stepping a few feet outside the white cube or ivory tower, taking a glance around--maybe even some of you in this room. Rather than concluding there's nothing interesting going on and quickly retreating behind a locked gate, I encourage you to step out far enough to learn more about the tremendous potential of distributed culture. The future of art is in those snug foothills--and it would do us well to nourish them.